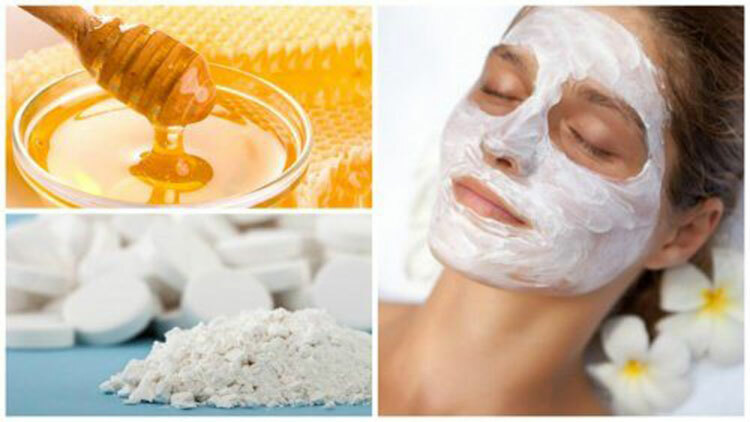 Due to the aspirin’s compounds and the properties of organic honey, you can make a homemade exfoliating honey – aspirin face mask with many benefits. The cosmetic industry has developed thousands of beauty products to make our skin look better and prevent premature aging. While some of these products are expensive, there are also more affordable alternatives out there. However, some of the chemicals in these products are harsh and can produce allergic reactions. Because of this, many people are trying homemade alternatives. These alternatives are made with easy-to-find ingredients and clean your skin without hurting it. You can make exfoliating creams that reduce the dark spots’ appearance, scars, and wrinkles with all natural ingredients at home. This is true especially for a mixture of aspirin and honey. This cream has properties that give your face a fresh look, along with several other benefits. In this article, we will share both the honey aspirin face mask benefits and the recipe to make it at home. Aspirin is used as painkiller and can be found everywhere. It calms headaches, muscular tension, and helps with circulatory problems. What some don’t know is that aspirin has compounds that help your skin. This is especially true for the skin around your face. This is due to its high concentration of a fat soluble hydroxy acid. This acid is used to make many healing creams, exfoliants, and other products. Using it on the skin reduces the appearance of dark spots and scars. It also helps get rid of dead skin. In addition, it has a powerful anti-inflammatory effect. This helps those who have acne or sensitive skin. The mixture of honey with aspirin is creating a treatment for revitalizing. The cream is reducing calm burns, laugh lines, and is reducing the free radicals’ effect. It is recommended for all skin types. This treatment with honey-aspirin face mask will not change the production of natural oil of your skin and will regulate the pH levels. It can also help get rid of excess oils that accumulate in your pores. If you haven’t tried its benefits, keep reading. You’ll also find out how to include it in your daily beauty routine. This is an easy and inexpensive face mask to make. The thing that you have to keep in mind is that attention needs to be paid for the honey’s origin. It needs to be organic to give you the most benefits. Put the aspirin in one mortar. Grind to a fine powder. Add the water and start mixing until the paste is thick. Mix in the organic honey with a spoon. Once you get a smooth consistency you are finished. As an additional option, you can add the vitamin E at the end. Before you apply the mask, you have to wash the face. This should be done with lukewarm water and a neutral soap. Make sure to remove any makeup with a cleansing milk or oil. When you’re ready, take the amount of cream you will need. Then, rub it all over your face. Be careful when applying it around your mouth and eyes. If possible, rub the mask down to your neck to get the best results. Massage for 3 minutes. Let the mask work for another 10 minutes. When time is up, rinse your face with lukewarm water. Finish the treatment with a moisturizer. Starting off, this treatment can be repeated 2- 3 times in a week. After that, once a week is enough. You’ll feel smoother, cleaner, renewed skin right away. However, if you continue using this cream, you’ll also feel other effects. Some of these visible effects include smaller pores, a reduction of dark spots, and less inflammation and puffiness. Before you use the cream on your whole face, first try testing the cream on a small area. This is important because it can let you know about any reactions you may have. Usually, this cream doesn’t cause any unwanted side effects. That being said, we can’t rule out the possibility of an unwanted reaction with some skin types. Start using this cream in your beauty routine. If you want your skin to be radiant you don’t have to spend a lot of money on professional cosmetics.